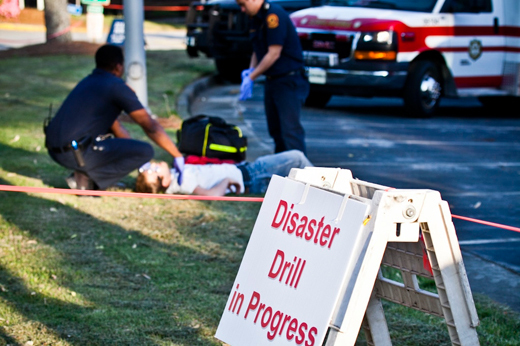 While Emory periodically conducts disaster simulations, like this one in 2012, there are steps everyone on campus can take now to be ready for possible emergencies. Emory Photo/Video. Emergencies can strike any time and anywhere — even on a college campus. The good news: It only takes moments to prepare for unforeseen disasters, such as weather, medical or public safety emergencies, but the benefits of emergency readiness can make a big difference, says Sam Shartar, senior administrator for Emory's Office of Critical Event Preparedness and Response (CEPAR). And that's what National Preparedness Month is all about — an opportunity for students, faculty and staff to review campus resources that can help everyone better prepare for emergencies, accidents or catastrophic events, according to Shartar. "Be Disaster Aware, Take Action to Prepare" is the theme for the 2014 National Preparedness Month, which is scheduled each September as students are streaming back to schools and campuses across the nation. Sponsored by the Federal Emergency Management Agency (FEMA), National Preparedness Month encourages households, businesses and communities to give some thought in advance to the risk of accidents and disasters and to create a personalized preparedness plan, which may address a range of events, from weather-related emergencies, fires or blackouts to earthquakes, hazardous material spills or terrorism threats. In concert with the national event, CEPAR is also announcing plans to enhance Emory's emergency notification system, adds Shartar. "From the end user's perspective, it's really the same enrollment process, but we're upgrading functionality by converting to a different company, Rave Mobility Safety," he explains. The major difference for the Emory community? "It's much faster, in terms of the ability to send out messaging," Shartar says. "We also now have the ability to receive confirmation that a message was actually delivered to a device, which we did not have before, and it allows us to have a 'one-button push' to activate multiple modes of emergency notification — text messages, email, outdoor sirens, social media, RSS messages to webpages, and cable messages directly to Emory Cable Television — using one platform." The new system is scheduled to go "live" on Wednesday, Nov. 5. For now, Shartar suggests the campus community take the pre-emptive step of programming two "short codes" into their list of cell phone contacts — 226787 and 678283 — accompanied by unique ringtones, so that recipients will be able to quickly identify Emory emergency alerts. Awareness of emergency-related resources on campus — or simply knowing where to look to learn more about them — can impact the safety of the entire Emory community in the event of actual emergencies, says Alexander Isakov, CEPAR executive director and associate professor of emergency medicine. "Understanding risks, being aware and dedicating even a little time to prepare for emergencies makes you disaster resilient and can save lives," Isakov adds. For instance, weather is probably the greatest threat faced on the Emory campus; tornadoes can occur year-round in Georgia, with peak periods expected in early spring months, notes Shartar. Knowing what to do in the event of a tornado warning or dangerous winds, being aware of where shelters are located on campus, reviewing CEPAR's online resources, and downloading a weather app — some are free — to your smart phone are all steps that anyone can take now, he adds. Emory's Emergency Notification Program, which offers options in signing up to receive weather or law enforcement emergency alerts via email, text messaging, Twitter or Facebook. In addition, there are simple steps individuals can take now that will pay off when severe weather or unexpected emergencies strike down the road, Shartar says. For more information, visit the CEPAR website at emergency.emory.edu.